If you live in Fall River, you've most likely picked your team. 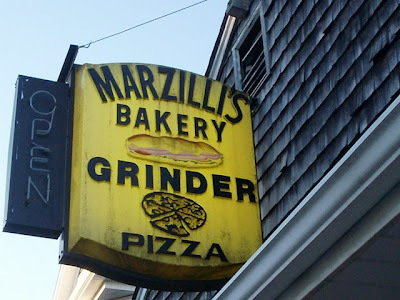 If you're like my family, you've picked Marzilli's Bakery as your number one homemade sandwich shop. If you're like the others (i.e., the enemies), you've picked Marcucci's Bakery - located just a few blocks up the street. I don't know what started this sandwich feud, but we Fall Riverites are very dedicated to our particular favorite. If you are a fan of the opposing bakery, whichever it may be, be prepared to back up your argument. You may want to get yourself a defense attorney - it's that intense. It's almost like the Jennifer Aniston vs. Angelina Jolie thing, only delicious. Since we hadn't had these sandwiches in way too long, we decided to get some for dinner. 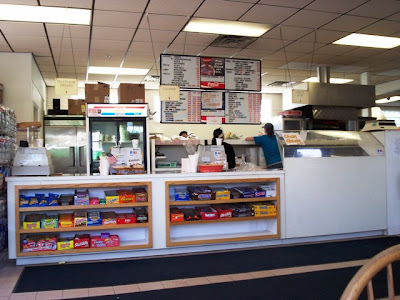 I called in the order for myself and my parents and picked up the sandwiches at around 4:30 p.m.
Marzilli's is a clean, organized sandwich shop with a few scattered tables, some stools under the window, a beverage cooler, a chip rack, and an under-counter candy display. That's about it. All of the sandwiches are made to order and are created right before your eyes. You can get them any way you want, the service is always fast, and the prices are amazing. 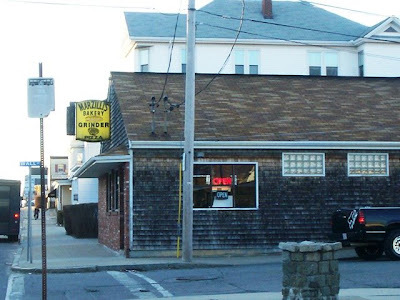 Marzilli's is definitely the place you want to visit if you have a large family to feed on a small budget. Why give a big name chain your business when you get can a much better sandwich for a lot less money? When I arrived home with the sandwiches, I unwrapped them all in order to take pictures before we tore them apart like wild animals. As I mentioned before, these sandwiches are huge. Just look at the size of the large!! 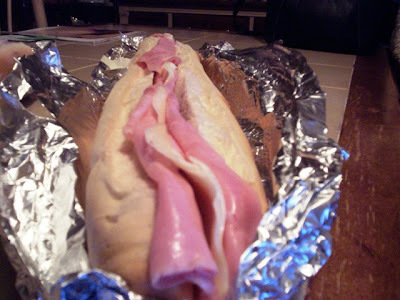 This sandwich is well over a foot long and is chock full of fresh meats and cheeses. The medium sandwich is equal to a woman's size 8.5 shoe (and yes, that is my sneaker) and is also stuffed with deliciousness. There is even that yummy meat overhang on each side, which we've always fed to whatever pet had been begging for it. Although the size and stuffing is tops, the real star here is the bread. The bread is always made fresh and is amazingly tasty. It never gets soggy and even keeps its softness if you've placed the sandwich in your refrigerator. It is by far the best bread that you could ever make a grinder with. Awww yeah! The large is so ... large. 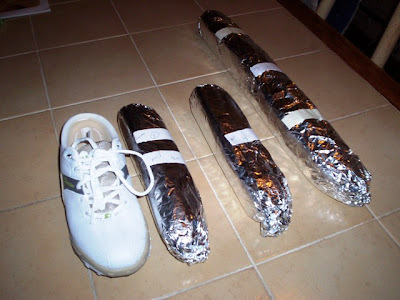 My sneaker near the medium sandwich. Needless to say, we loved everything. 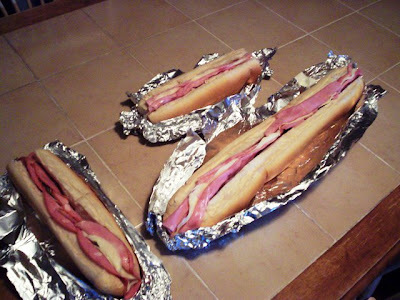 When my sister and I were young, my father sometimes came home with two large Italian subs on Saturday afternoons - one for himself, and the other to split between me and Mal. It got to be such a treat that whenever he came home, Mallory and I would listen to see if we could hear the paper bag crinkling as he walked in the door. My family has been eating these sandwiches for years, and there is no reason why we will ever stop. Team Marzilli's is definitely alive and well at our house. Although there is nothing wrong with favoring Marcucci's, I always wonder if those people have even tried Marzilli's before. I don't understand how anyone can prefer another, but to each his own. I enjoy this friendly feud that my fellow city residents have, and as long as these two bakeries are up and running, I'm sure that there will be many more discussions about which side we prefer. I just pray that if you do pick a side amongst a large crowd, you choose the majority favorite. If not, good luck defending that sandwich. Marzilli's Bakery is open from 7 a.m. to 6 p.m. Monday through Friday, and 7 a.m. to 4 p.m. on Saturday.